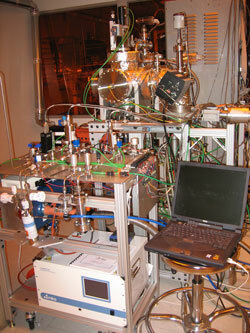 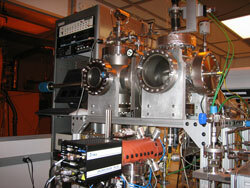 ALD UHV reactor with MKS Vision 1000C mass-spec for real-time process sensing and in-situ chemical diagnostics. 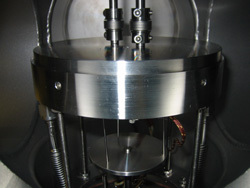 Delivery system to ALD reactor with MKS 03mega ozone generator and Mole Delivery Device for delivery of low vapor pressure metalorganic sources. 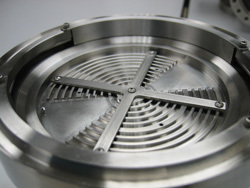 "Mini-ALD" reactor embeded in UHV chamber with cap down. 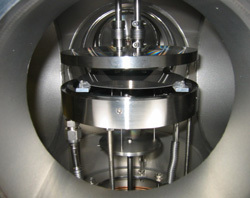 View of mini-reactor during wafer transfer from load-lock with cap up. 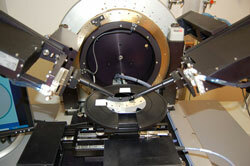 Automated probe station for sheet resistance, IV and CV measurements with HP4145B and Agilent E4980A LCR precision meters and Newport precision motion control. 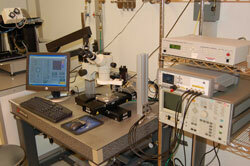 NI Labview interface for IV, CV and sheet resistance (4 point probe) measurements. 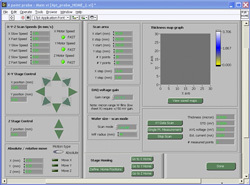 Thickness, capacitance and leakage maps are automatically computed. 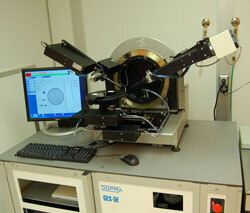 Sopra GES-5E spectroscopic ellipsometer for thin film thickness and refraction index measurement from 190 to 800 nm range. 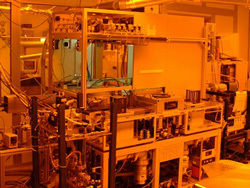 Sopra GES-5E allows automatic mapping of 200x200 mm wafers and is equipped with microspot, CCD spectrograph and automatic goniometric bench for variable angles. 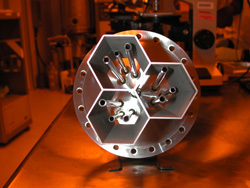 Ulvac CVD cluster tool (no longer in operation). 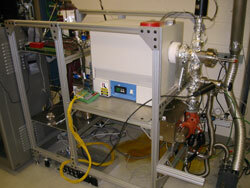 Our original work on chemical sensing and real-time film thickness metrology for CVD processes was achieved on this tool.